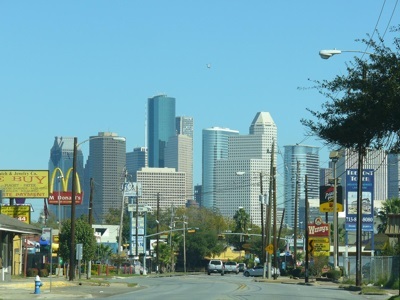 Houston is the most populous city in the state of Texas, and the 4th most populous in the United States over all. As of 2006, Houston had an estimated population of 2,144,491, with more than 5.5 million people living in the Houston-Sugar Land-Baytown metropolitan area, the 6th most populous metropolitan area in the United States. Houston is perhaps most famous internationally for being home to NASA's Lyndon B. Johnson Space Center, which contains the Mission Control Center (MCC-H), the NASA control center that coordinates and monitors all US manned space missions, including the Space Shuttle and activities aboard the International Space Station. On display at the Johnson Space Center is a near complete Saturn V moon rocket, and an Apollo Command-Service Module (CSM), both of which were originally prepared for Apollo missions which were cancelled. It is because of the presence of the Johnson Space Center, as well as the city's other aerospace connections, that Houston gets its nickname: "Space City". The city of Houston is also home to the Texas Medical Center (which is the world's largest concentration of health research and care institutions), the Port of Houston (which is the busiest port in the United States in terms of international cargo tonnage, and the second busiest in terms of over all tonnage), and more Fortune 500 corporations' headquarters than any city save for New York. Visitors to Houston will be sure to want to see the Houston Museum District (known informally as simply "The Museum District"). This area is home to at least 16 different museums, including the Byzantine Fresco Chapel Museum (containing the only intact Byzantine frescoes in the Western hemisphere), the Chldren's Museum of Houston, the Contemporary Arts Museum, the Houston Museum of Natural Science, and the Holocaust Museum Houston. Also in the Museum District are several parks, Houston Zoo (which contains 4,500 animals from over 900 species), and the Miller Outdoor Theatre. The places found in this book are the most positively reviewed and recommended by locals and travelers. 2,000 places listed and organized in four groups. "TOP 500 SHOPS" (104 Store Categories), "TOP 500 RESTAURANTS" (113 Cuisine Types), "TOP 500 ATTRACTIONS" Landmarks, Historical Buildings, Parks, Churches, Botanic Gardens, Cultural Centers, Cinemas, Performing Arts, Art Schools. "TOP 500 NIGHTLIFE SPOTS" Lounges, Bars, Pubs, Gay Bars, Hookah Bars, Latin Bars, Sports Bars, Karaoke, Comedy Clubs, Nightclubs, Jazz & Blues, Adult Entertainment and many more options to visit, relax and enjoy your stay. Texas resident Andy Rhodes knows the best ways to experience Space City and the surrounding areas, from catching a performance at The Orange Show Monument to hiking through one of the Piney Woods National Forests. Rhodes includes unique trip ideas like Texas Family Road Trip and Houston’s Huge History, as well as information on dining, transportation, and accommodations for a wide range of travel budgets. Complete with details on everything from visiting the NASA Space Center to catching some sun in Corpus Christi, Moon Houston & the Texas Gulf Coast gives travelers the tools they need to create a more personal and memorable experience. Lonely Planet Texas is your passport to the most relevant, up-to-date advice on what to see and skip, and what hidden discoveries await you. Rock out, get the blues or chill to country classics in live-music capital, Austin, or appreciate just how big Texas is on a hike at Big Bend National Park; all with your trusted travel companion. Get to the heart of Texas and begin your journey now! The Perfect Choice: Lonely Planet Texas, our most comprehensive guide to Texas, is perfect for both exploring top sights and taking roads less traveled. Looking for more extensive coverage? Check out Lonely Planet's Southwest USA guide for a comprehensive look at all the region has to offer. Houston is the largest city in Texas, and it’s a city that’s calling your name if you’re looking for unique cultural, entertainment, historical and culinary experiences. It offers museums, festivals, restaurants and other sights that celebrate worldwide cultures. Houston in 3 Days is more than a generic itinerary for travelers. It will lead you to the best sights that everyone wants to see, but also to eclectic, out of the way places that you’ll be so happy to have found. Create your own history and experience in the fourth largest city in the United States. Whether you’ve been to Houston before, or are a first-time visitor, this book will lead you on a well-planned journey. You don't fall into tourist traps when you travel with Frommer's. Doing so is like having a trusted friend show you around, taking you to the places locals like best. That's because our guidebooks, unlike much of the competition, are written by resident experts (not outsiders)―like Janis Turk, the author of Frommer's Texas, and the managing editor of San Antonio AT HOME magazine. In her highly opinionated book, she'll help you sort through the options so you can tailor a vacation that's right for you. Frommer's Texas covers all of the Lone Star State's highlights―from the vibrant nightlife in Austin to the historic sights of Dallas and San Antonio, from the trails of Big Bend to parades of longhorns in Fort Worth and more.